It seems everywhere you turn these days, you hear someone else telling you about how the importance of customers: Your call is important to us. We’re listening to our customers. We need your customer feedback. With all these people focused on the customer, you’d think things would be pretty darn good for those of us on the customer side – especially in light of the recent recession and tough economic times. But if my recent experience is any indication, the message that customer-facing personnel are there to actually help the customer somehow isn’t getting through. With all the marketing channels and new media opportunities available today, how do you ensure your marketing messages are heard above the noise? What creative ways have you found to make sure your marketing initiatives hit the mark? 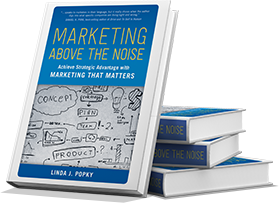 We’re looking for case studies and anecdotes for our forthcoming book Marketing Above the Fray: Dynamic Strategies to Propel Your Business to Market Leadership in Today’s Crowded World. Let us know if you’re interested in being interviewed about the innovative ways your organization is using marketing to achieve leadership and meet your business goals. 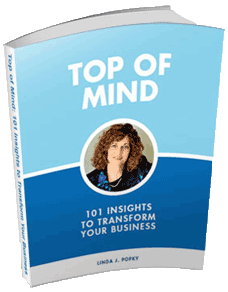 Learn how with our teleseminar, Big Marketing Tips for Small Organizations, 11:00 am PDT, August 12. Join us on August 12 at 1:00 am PDT. Not able to make the live session? No problem. Our sessions are recorded and available to you as downloadable MP3 files. Get your own personal business advisor – someone you can call with a new business idea or strategy, review proposals, or strategize client situations. Contact Linda to find out more about the Private Roster Mentor Program or our Marketing Leverage Coaching Program. Limited slots are available now. Listen to our podcast series, Check out the latest episodes in our podcast series, Marketing Thought Leadership. Upcoming guests include Josef Chervenka on the new vision for NorCal BMA, Karina Jensen, on the global use of social media, and Brian Solis on how businesses can build, cultivate and measure success in the new Web. Leverage2Market’s Linda has joined the board of the Northern California chapter of the Business Marketing Association, the leading business-to-business marketing organization in the San Francisco Bay Area and Silicon Valley as the VP of Marketing. NorCal BMA offers a robust set of programs to members and the marketing community at large, including regular roundtables on various marketing topics, as well as monthly educational and social events, networking, resources and B2B job listings. Linda facilitated the business panel at the Career Forum presented by Nova and the UCSC Silicon Valley Extension in May. Linda hosted marketing metric expert Dr. Roger Best in a webinar, Taking the Mystery out of Metrics: Making Marketing Easy to Measure in June. In June, Linda delivered the workshops Creating Powerful Proposals for Women in Consulting, and Marketing Strategies that Sell for Small Businesses for KeyPoint Credit Union. We are in the process of booking our Fall/Winter speaking schedule. If your business or association could use a dynamic, thought-provoking presentation or workshop on marketing or business strategy, please contact us.